If you’re interested in getting into cichlid keeping, the sheer number of species might be causing your head to spin. There’s South American cichlids, Malawi cichlids, Tanganyika cichlids, Central American cichlids… dwarf cichlids, huge cichlids… aggressive cichlids, docile cichlids and so much more. 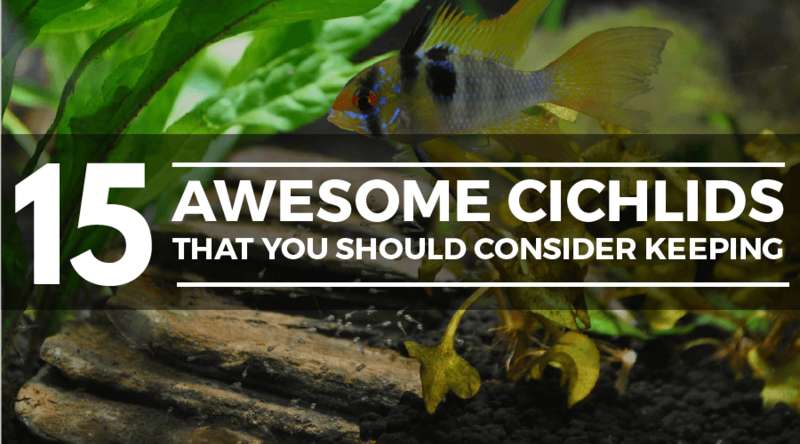 To help you out, we’ve compiled a list of 15 of our favorite types of cichlids for home aquariums. We’ve tried to sample species from all parts of the world for various tank sizes and with varied aggression levels. All are colorful and fascinating, and there are even two species in there for the beginning breeder! Note: Diet is very important to the health of many (if not all) Cichlid species. We recommend the TetraCichlid Crisps to anyone considering keeping Cichlids. If I say cichlid, you say… angelfish, of course! This aquarium classic has been a favorite in the hobby for many years and is still one of the most popular cichlids. Most commonly kept is Pterophyllum scalare, which has been selectively bred quite extensively and is available in all sorts of wonderful colors and patterns. 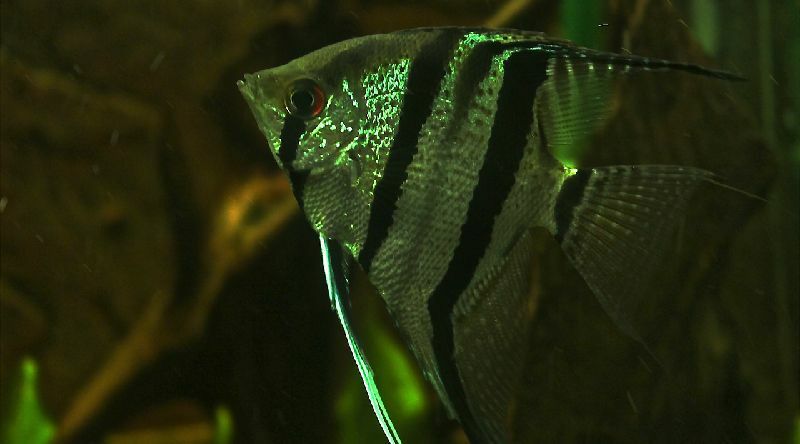 A well-maintained angelfish aquarium is a feast for the eyes, but keep in mind that there are quite a few misconceptions out there about these cichlids. Contrary to what many sources (and even aquarium stores!) will tell you, they are not fish for small tanks. They shouldn’t be kept alone: their complex social structures make a group of at least five to six fish necessary. Tank mates to go with your Angelfish are a possibility, but avoid any fish that are nippy, extremely active or too small. In our humble opinion, the ideal angelfish set-up would be an Amazone biotope tank with plenty of leaf litter and wood. Corydoras make a great tank mate choice that are sturdy enough to be left alone and won’t bother the angelfish. Temperament: Requires calm tankmates but will eat small fish. 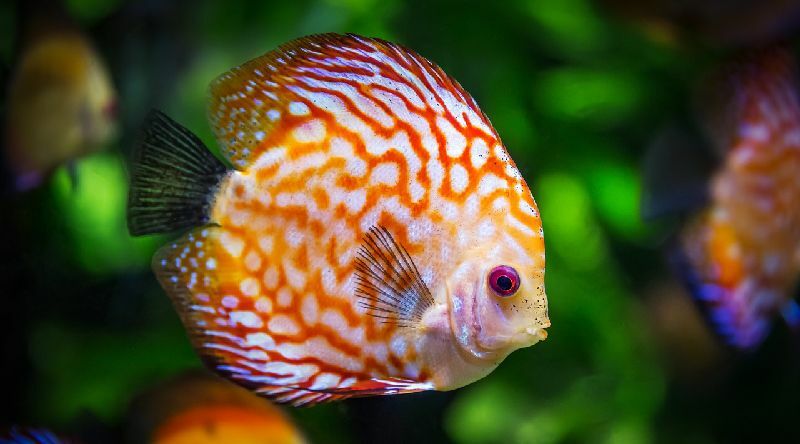 Much like angelfish, discus fish are considered the ‘holy grail’ by many aquarists. The king of cichlids – maybe even the king of all aquarium fish. This regal status is thought to come with extremely difficult care and all sorts of specific requirements. Now, discus fish are definitely not beginner proof. But are they only for the absolute most experienced aquarists? No. If you follow their care guidelines, keeping your discus fish happy and healthy is not rocket science by any means. An Amazon biotope set-up would make a great discus environment. Adding some plants is a possibility, but keep in mind that these fish require very warm water that is soft and quite acidic. Not all plants will appreciate this. The same goes for tankmates: choose them with care! We like hatchetfish from the genus Carnegiella, as they don’t reside in the same water layer and are very calm. 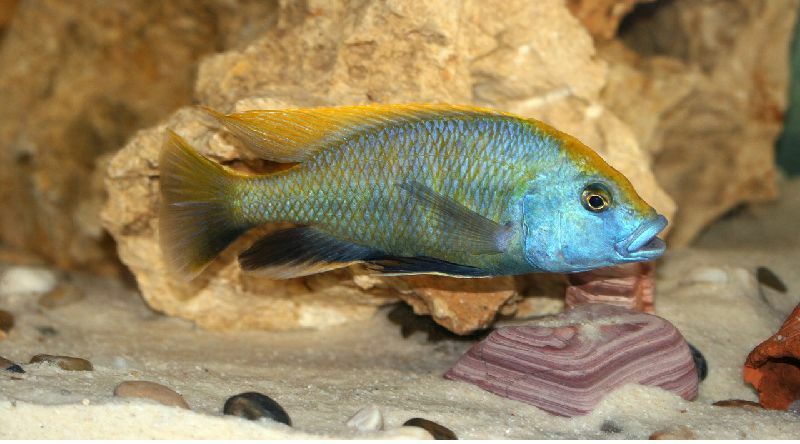 Also known as electric blue haps, the males of this mouthbrooding Malawi cichlid species are real eye catchers. A great choice if you’ve got some fishkeeping experience and are looking to set up a Malawi aquarium! A sandy substrate, plenty of rock mounds and hard water with a basic pH are musts for this fish. 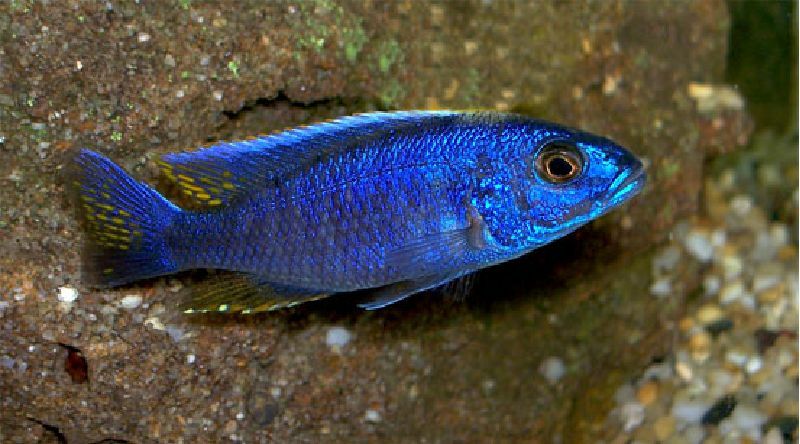 If you’re interested in keeping electric blue cichlids, keep in mind that you’ll have to get multiple females for every male to prevent breeding stress. A harem consisting of one male and at least three females is ideal. Tankmates are a possibility, but avoid anything smaller than the cichlids themselves. These is a predator that will gladly eat anything that fits into their mouths! If you don’t want a single species set-up try to find Malawi cichlids that reach a similar size and aren’t too aggressive. Larger Plecos that can tolerate the hard water and high pH can also be a good option. Temperament: Intermediate. Not extremely aggressive but will eat smaller fish. Interested in breeding cichlids? Convict cichlids might be the perfect choice for you – if you’re willing to set up a single species tank, that is. 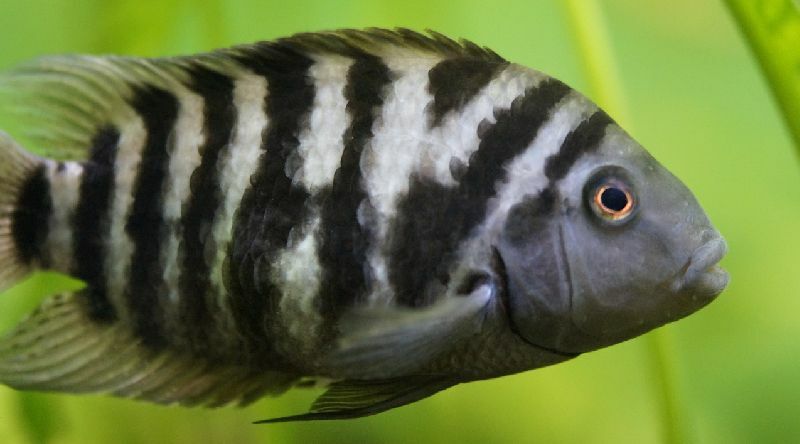 Although these striped Central American cichlids are often sold to unsuspecting aquarists as perfect community fish, they don’t play nice and are actually rather aggressive. Other than that, they are pretty easy to keep and suitable for beginners. An aquarium of at least 30 gallons works well for a single pair. If you want to keep more, be prepared to get a much larger tank to prevent territorial aggression. Rocks, wood and hides such as coconut caves and flower pots will be appreciated. Sturdy plants can work as well, but try to stick to types that don’t grow in the substrate to prevent uprooting. Water values are not much of an issue as long as you do regular water changes and keep things stable. 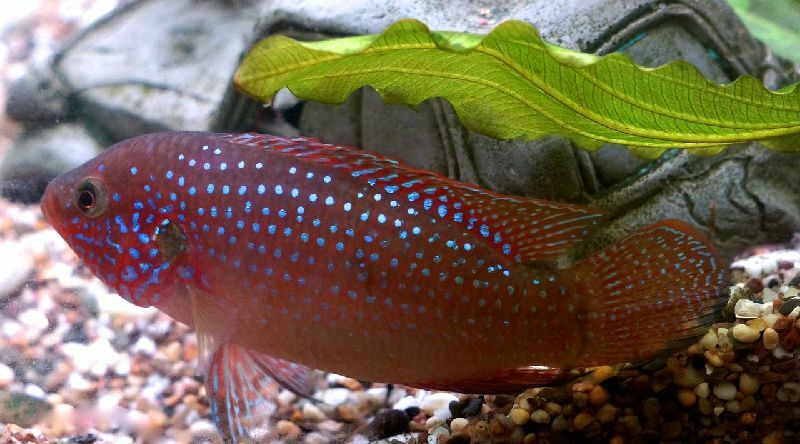 This colorful South American number isn’t called the cockatoo cichlid for nothing. Males can develop amazing yellow-orange coloration on their crest-like dorsal fins, which are flashed during aggressive displays or breeding time. Its smaller size and relatively easy care make this a great cichlid for beginners. A long aquarium of at least 20 gallons should be large enough to house a pair of cockatoo cichlids. Relatively soft water and a slightly acidic pH should work well. Be sure to provide plenty of hiding places in the form of plants, décor and caves. Because these are dwarf cichlids and not too aggressive, they can be kept in community set-ups as long as there are no aggressive species present. Small schooling fish like neon tetras would make a good choice. 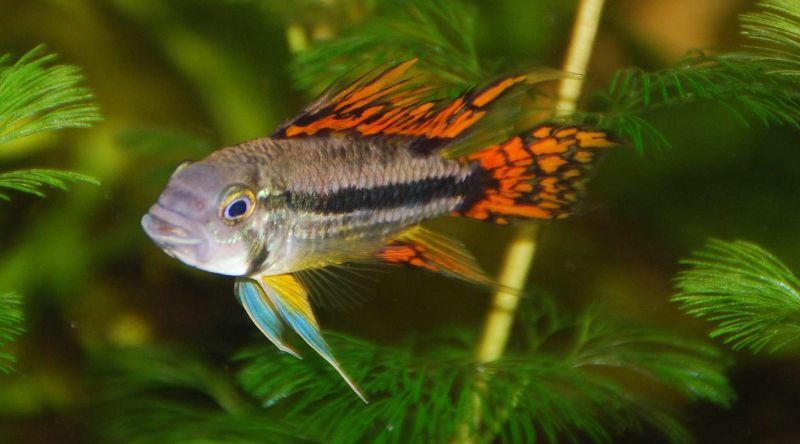 Check out our Apistogramma Cichlid guide is you’re interested in learning more about this awesome species! 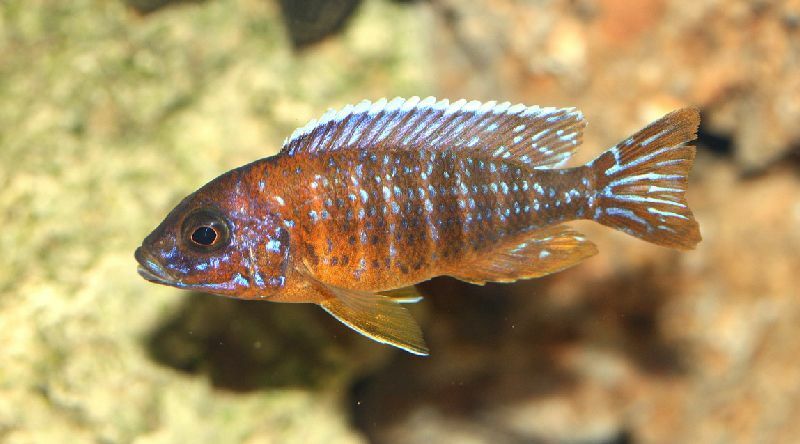 Another amazingly colored genus from Lake Malawi, Aulonocara are better known collectively as peacock cichlids. All subspecies are beautiful, but Aulonocara jacobfreibergi (also known as Malawi butterfly or African butterfly peacock) must be one of the most amazing of all. Males usually feature a dazzling mix of blue and orange as well as subtle vertical barring, but there are actually multiple color varieties out there – all spectacular. Because this species naturally likes to sift through the substrate in search of food, it’s important to use sand rather than gravel. Keep the pH high and the water hard; some plants that naturally occur in lake Malawi, like Vallisneria, can be used. Water quality should be high at all times. When it comes to tankmates your choices are a little limited due to the temperament of this fish, but as with electric blue cichlids larger Pleco varieties that can handle these water values might make a good option. We are not leaving Lake Malawi just yet. It has one more stunningly colorful species to offer that we just have to mention! The mouthbrooding electric yellow cichlid (or yellow lab cichlid) is an Mbuna variety appreciated by cichlid keepers for its peaceful nature. It is pretty community proof and will do well in a mixed Malawi biotope with plenty of other Mbuna varieties. Be sure to keep several females for every male: the ladies can be pursued rather intensely during breeding time which is a source of stress. To imitate the electric yellow cichlid’s natural habitat, provide a light-colored sandy substrate and plenty of rock formations. Keep the pH basic and the water hard. Oscar cichlids are one of the most popular cichlid species out there, and for good reason. Their big personalities, large size and beautiful color patterns make them a very attractive choice. Don’t just run out to the aquarium store to get your own Oscar cichlid, though; do your research first. There are a lot of misconceptions out there about this species. First off, tank size. We’ve seen a range of minimum tank sizes discussed for this fish, with some sites suggesting set-ups as small as 30 gallons. For a fish that reaches an adult size of 13.5”, this is obviously not okay. In fact, you’ll need a tank of at least around 120 gallons for one pair. Plenty of filtration is a must, and don’t think you’ll be able to create a pretty aquascape in your Oscar tank. These fish are avid “interior designers” that uproot plants and move around driftwood and rocks. All in all, Oscar cichlids are a beautiful species and not extremely challenging to keep – but don’t believe everything you read about them. Temperament: Not too aggressive but will eat smaller fish. 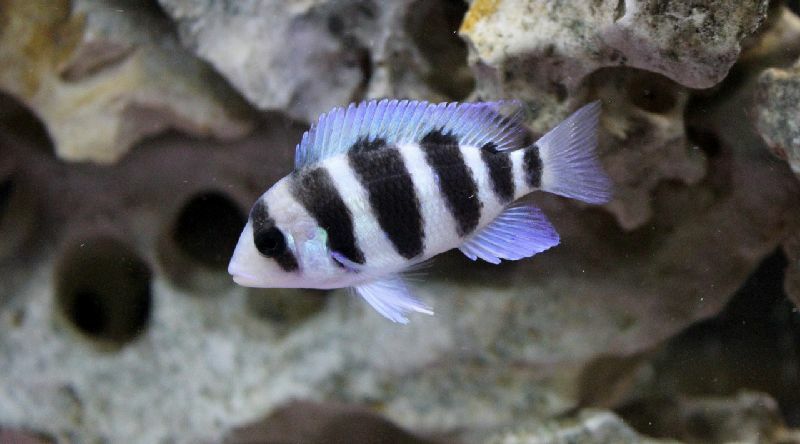 Like convict cichlids, the kribensis cichlid makes a great breeding project for beginners. In fact, this species is so prolific many aquarists are left scratching their heads wondering how to make them stop producing fry! All in all, though, kribensis cichlids make a good beginner choice and their breeding behavior is fascinating to watch. The female’s belly turns bright red during breeding time, which makes for a spectacular sight. If you’re interested in keeping kribensis cichlids, keep in mind that they become very territorial during breeding time. In all but the largest tanks, stick to only one pair to avoid issues. Tankmate-wise, quick schooling fish probably work best. Be sure to provide plenty of hiding places in the form of plants and flower pots placed upside-down. We’ve discussed several Lake Malawi cichlids, but as you might know Malawi is not the only lake African lake that houses many popular cichlid species. There’s also lake Tanganyika, which is called home by various species including Cyphotilapia frontosa (also simply known as the frontosa cichlid). Although this humpheaded species is unsuitable for all but the largest home aquariums, it’s definitely a fascinating choice if you can provide the space it needs. Keep your frontosas in groups of at least five fish, preferably mostly females. The water should be alkaline and quite hard and there should be some décor in the form of flower pots and other cave structures. Other Tanganyika cichlids can make good tankmates, but keep in mind that this is an active predator. Be sure to avoid fish that are notably smaller! Another African cichlid species, although this one doesn’t originate from the rift lakes. 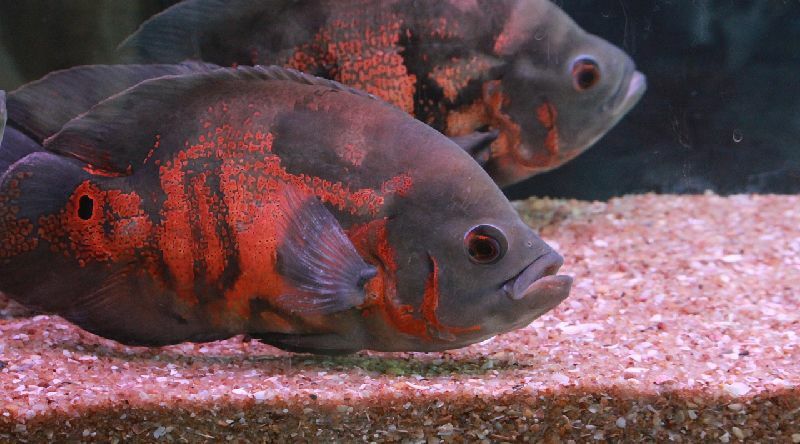 Jewel cichlids truly live up to their name, featuring beautiful red coloration with blue spots and a yellow tail fin. Their aggressive nature (especially during breeding time) makes them unsuitable for most community tanks, but if you’re willing to set up a single species aquarium their beautiful colors and interesting behavior make up for this inconvenience. 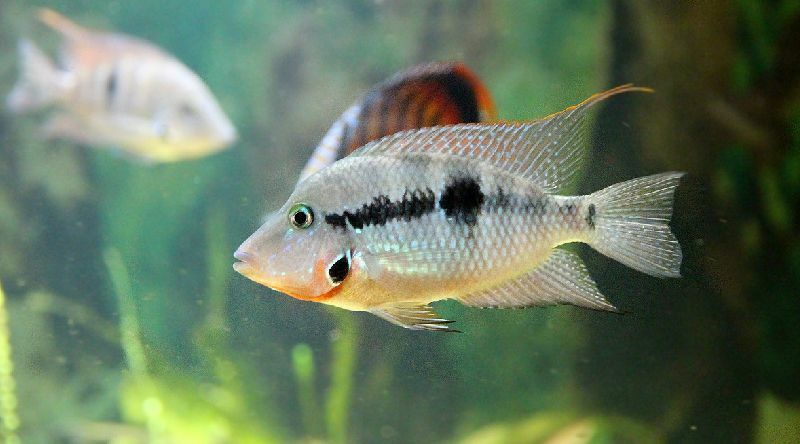 If you’re interested in keeping jewel cichlids, make sure you get a confirmed pair. Provide lots of hides and go for a sandy substrate, as these fish love to dig. Plants will be appreciated but most will be treated mercilessly; try very sturdy species like Java fern and Anubias that don’t grow in soil and can’t be uprooted. Temperament: Very aggressive, be careful! Venustus cichlids are a relatively large species from lake Malawi often kept for their beautiful blue-yellow breeding coloration and relatively peaceful nature. 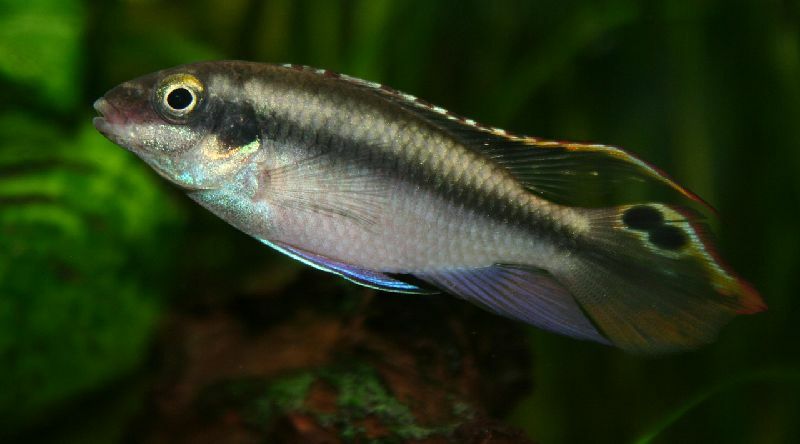 You might also see them being referred to as venustus haps: they are members of the Haplochromine tribe of cichlids. If you’re interested in keeping venustus cichlids, an important point to keep in mind is that the males are not the best team players and can become quite aggressive. You might want to keep just a single specimen, only females or at least multiple females for every male. Provide plenty of hiding places but be sure to also leave swimming room. Temperament: Males can become very aggressive. Additionally, these will eat any small fish they can catch. We’re moving from Africa to Central America, where the popular firemouth cichlid naturally inhabits various habitat types. This fascinating species is named after its red throat area, which is puffed up during territorial squabbles. This is one of the easier large cichlid varieties to keep, as it’s not too fussy about water values and temperature; as long as the water quality is kept high it should thrive. You can recreate its natural habitat with some rock formations and plenty of driftwood. Tankmate-wise, you might be surprised to find out that livebearers are a good option. They naturally occur in areas where the firemouth cichlid can also be found and are large enough to avoid being eaten. Fry will be consumed by the cichlids, which helps prevent overcrowding. Temperament: Can be territorial, will eat smaller fish. 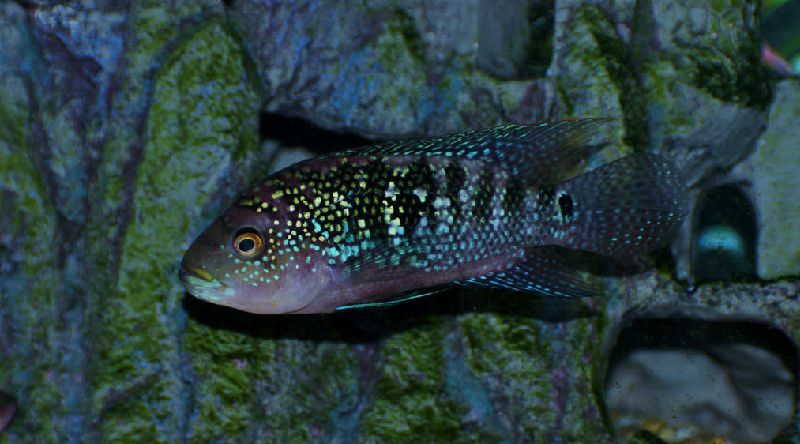 One of the most commonly kept Central American cichlids is the colorful Jack Dempsey cichlid. This species is a pretty good option for beginners as it doesn’t require very specific water values and is flexible when it comes to temperature. A pair of these beautiful cichlids will do well in tanks of around 70 gallons and up. Provide a sandy substrate that allows for digging around and add some nice looking rocks as well as plenty of driftwood and branches to imitate the natural habitat. Keep in mind that these fish do move around décor, so if you’re set on aquascaping your tank they’re not the best choice. Choose tankmates carefully; that means avoid small fish that might be eaten or fragile species. Plecostomus catfish are quite sturdy and might make a good option. Temperament: Not the nicest – can be quite aggressive.